The following sections cover the use of the cellSet class in your utility (function object) code, bits and snippets of information on objectRegistry and regIOobject, as well as how to get foamVTK to really pick up cell sets from the time-step directories. I am freely exchanging “cell set” and cellSet in the text, they both relate to the cell set implementation in OpenFOAM. A cell set is basically a list of cell IDs that map to the cells of an unstructured mesh in OpenFOAM. There are sources of information on the OpenFOAM Wiki that show how to create cell sets using the setSet application and how to work with cell sets using the topoSet utility. We have written about cell sets in the OpenFOAM Technology Primer book as well. Most of the information available online deals with creating cell sets using some conditions on field values and/or topological sources for extracting the cell IDs from the available simulation data. and to centralize the IO control, the simulation time class Foam::Time acts as the observer that contains a list of pointers to registered IO objects subjects and forwards write call to them. This is it in a nutshell. The reality is a bit more involved than that, and we cover all the nuts and bolts in our Programmer Training. we can expect the cellSet to be written to each time step since runTime.timeName() has been passed as the instance argument to the IOobject constructor. I’ll get to this point later on, when the issues with the VTK conversion workflow appear. Note: previous covers the programming of libraries in OpenFOAM. The functions and classes that are implemented below can be put into the testCellSet application, but that’s a bad practice. A finished implementation of the changing cell set library example can be found in the sourceflux-blog-code repository. The following tutorial assumes a library implementation. Steps in implementing the functions/classes are not covered here. If in doubt, go over the library programming tutorial and open the solution source code. // Get the handle to runTime. // Get the pi constant. // Normalize the radius oscillation period to 2 seconds. // Set the rotation center. // Initialize the rotation vector. // Modify the rotation vector X coordinate. // Modify the rotation vector Y coordinate. // using the rotation vector. // Clear the cell set. // Get the handle to the mesh cell centers. // the center is within the circle. // Insert the "I" cell ID into the cell set. in file db/Time/findInstance.C at line 142. These lines have an important consequence for any registered IO class. For example, if someone programs a class of that should write some of its data out so that it is handled by Foam::Time, the class needs to inherit from regIOobject and override the virtual write(Ostream&os) member function. However, if this class is to store its data outside the directories allowed by regIOobject, the output will redirected to the time-step directories. is using the C++11 standard because I just don’t want to think about re-typing in constructors simply because I am overriding a single member function. is using the override specifier which enables the compiler to perform compile-time checks on writeObject. For example, if you just forget the const specifier, and implement the virtual bool writeObject, compiling the changingCellSet will fail. The changingCellSet::writeObject will not be selected, instead, regIOobject::writeObject would be called, resulting in a faulty output that can’t be read by foamToVTK. Using override lets the programmer know about differences in the virtual member function signature during compilation, making it easier to detect such errors. and that’s it. You can find the application in the applications/test sub-directory of the sourceflux blog code repository, and the library code in the src/changingCellSet directory. Note: If you are dead set against C++11 for whatever reason, in the sourcelfux-blog-code repository there’s a C++2003 (regular OpenFOAM code) implementation. The only differences are not inheriting constructors and no override specifier for the virtual member function. Compile the application, clean up the modified cavity test case, and run the test. since it specifically picks up /polyMesh/sets/testCells for each time step directory. The circular cell set that is oscillating in it’s diameter and rotating around an axis can be animated in ParaView by opening VTK/testCells*vtk. A HashTable with keys but without contents. // Access n-th key. 5 used in this test. // Loop over the keys of the cell set. Note that the toc() member function provides only the constant access to the list of keys. I’ve actually made the title image myself this time, using the StippleGen 2 created by evil mad scientists. It’s based on a photograph of Nikola Tesla. 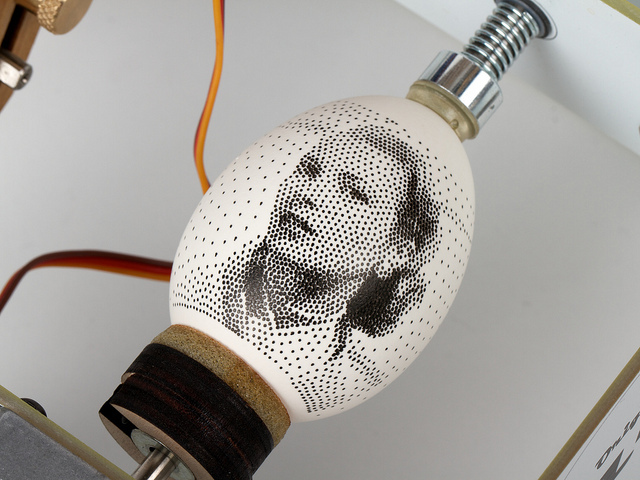 The image shows a voronoi diagram of points used by the Egg Bot printer. b) Why is a homepage required to comment? c) Paraview not being able to read sets is not completely correct, since when starting it with the OpenFOAM reader (e.g. when visualising a case with paraFoam) you can click the checkbox “Include sets”. However, I doubt that it can pick up cellSets in the time-directories. b) You are not really required to comment, as you can access the content without commenting. I really don’t get your point here. c) Yes, you are right about that one. a) “If not, leave a comment in a comment section below, so that we get a feeling that people are actually reading these posts…”. I probably should have noted that the verb was supposed to be past tense ;). If Tomislav hadn’t written this, I probably wouldn’t have commented at all. b) No point, just asking. The homepage is displayed nowhere on the page anyway, so I don’t see the need. But then again this means I can put anything I like. and c) @Tomislav: Sure, I wouldn’t have expected that either. And it probably would have me taken ages to get around this. So, thank you for that. b) I’ll try and figure that out as soon as I catch some time, could be just the CMS that we are using, there must be a button somewhere..
b) Not sure, thanks for pointing that out, I’ll take a look into that. c) The entire post is about changing cell sets, stored in time directories. Anyway, for me at least it was interesting to see that the instance parameter of the IOobject is limited to a set of admissible values coming from the basic OF simulation case structure – hence this post. Just a comment on my previous experience with cellSets: I needed to keep track of each cell index, which a HashTable – as expected – is not interesting in provide. The solution was to read cellSets as labelLists and store data as a List. Not yet tested with a huge mesh, hope reading cells from a list don’t add a big overhead to my solver. Hm… regarding the overhead of the solver, the problem of using lists or dynamic lists would be the possible linear complexity of appending elements at the end, if the new list size is larger than the capacity of the container. The best way to find this out is to do a benchmark calculation with different cell sizes, and compare the relative cost of your cell sets operations with the rest of the solver. You can do that using valgrind. Depending on the number of cell sets, their sizes and the fact if they change their contents or not, it might be that no observable overhead is introduced to the solver.. Thanks for the interesting post, but I think you may have missed a very simple solution. I have tested the code below on both the official and extend version of OpenFOAM and it works. The trick is to explicitly set the instance after the set is created. This is the approach used in the setSet utility. I hope this suggestion is useful. Thanks a lot for the tip! Changing the instance is what I tried at first… however, the foamToVTK asked for the sets to be in runTime.timeName() + ‘/polyMesh/sets’ otherwise paravew won’t pick up a changing set – it just displays the first set it finds in the runTime.timeName() dir. I’m trying to extend this tutorial based on cellSet to pointSet. In first place I don’t want any dynamic issue; only create an sets of circular points which satisfies the circumference equation, and store them in Time::timeName()/polyMesh/sets. Well, I have inherited then from pointSet.h instead of cellSet.h and reproduce the same steps accordingly to my case. Is not possible to do this tutorial by using points and later convert them to VTK? In fact, when I instantiate my class with the default constructor it works, so the problem should be in the inheritance from the IOobject-based constructor (const IOobject& obj). Ooops!! Make/options file was wrong at including… Too many hours to find the error. pointSet works as right as the cellSet. Thank you for your reply. Another question… As cellSet inherits from topoSet and this one uses a labelHashSet as container, how could I access to the elements of the cellSet? So you can access the elements of the labelHashSet, in the way HashSet allows it, using the  access operator: bool operator (const Key &) const. In general, whatever you need from labelHashSet and is not provided by the cellSet or topoSet you can find in the HashSet class. If you use the official source code browser, you will be able to see all the member functions inherited from parent classes. You are right, you can “access” it via  but it returns a bool type instead of a vectorField, so it cannot be desferenced. For example, in this post you can get the labelList of your changing cellSet but you can’t see what point of the fvMesh corresponds to such label. It looks that HashSet is the fastest container type in C++ or OpenFOAM so it would be useful to can manage it as a labelList. Is there any alternative? Thanks for the feedback! What you can also do is to use forAllIter and cellSet::iterator::key() to get the key value. I’ve updated the blog post with your feedback and I’ve added the forAllIter code snippet. small question, does this also work in parallel, when the moving cellset is in between two processor boundaries? thanks for code above, it helped me a lot. I just have a further question which you can maybe answer easily. I want to access the Coordinates of the cellSet, unfortunately I had no success with this. This is what I got so far, using *.toc() to access the HashLabel list. Next step would be to impose a force onto the cells in dependence of component y. Here I am also missing the right funtion. I tried for pressure as example with p[sensorCell[i]]=10 – also no access. Solver is compiling here. On the side, is there any markdown syntax or similar supported in your comments? Thanks for the input! Yes, you can use standard markdown to format your comments. Thanks for a very instructive blog post! I have not tried it. Just a suggestion. Thanks for blogs. I read thruogh many of them and they helped me a lot. Concerning the write problem, couldnt you use the IOObject ctor where you can specify instance, local, and name? In this ctor you can give subfolders as l”ocal”. As far as I saw in code snippet above you used the IOObject ctor with instance and name only.